ART Corp. provides an excellent experience in conducting state-of-the-art Nonlinear Finite Element Modeling & Simulations for the purposes of Design, Validation, and Testing of virtually any Mechanical/Structural components and complete systems. This Computer Simulation approach provides invaluable benefits such as: Reducing the expensive physical tests, achieving a cost-effective design, and the capability to analyze the separate effect of each individual parameter. Experts at ART have excellent experience in creating state-of-the-art Finite Element Vehicle Model for different size/class of vehicles. 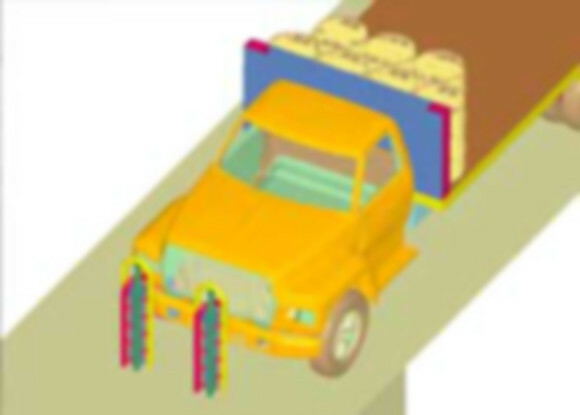 Many accurate and validated FE model are available for conducting advanced simulations for vehicle crashworthiness, Transportation safety, and Physical security analysis. Some of the large selections available of accurate and validated vehicle models are shown. All available FE vehicle Models have been validated and tested in numerous Impact scenarios. Several Dummy Models have been created, validated and tested to represent the occupant during vehicle impacts. FE models for Hybride-3 Dummies and Side Impact Dummies (SID) are available and have been used extensively. Many FE Model for Airbags, Seat-Belts, and other restraining systems are also developed, tested and validated by experts at ART. Detailed FE models are also created for Occupant Compartments. Comprehensive studies could be conducted for the purpose of crash investigation and severity analysis. The validity of new safety device could be investigated and tested by analyzing the statistical data of the crash incidents. Within the last few years, comprehensive FE Analyses have been conducted to design, test , and improve the performance of Anti-ramming Walls and Barrier for Physical Security Protection. Structural and concrete Security Perimeters have been modeled and simulated by FEA in several impact conditions (K4, K8, K12, etc.). Most of these perimeters have been tested in actual tests and the test results correlated very well with the FE simulation predictions. Many Physical security devices could be modeled through FEA to ensure its effectiveness for the expected threat. Based on the FE simulation results, the proper device/size is selected and integrated in the complete security system. Several successful FEA are conducted in modeling Road-side Guard Rails and sign supports. FMVSS 208 & 214 Tests are accurately modeled. Impacts with New Jersey barrier, Vertical walls, and offset Deformable Barrier were also modeled.